Bev Harris, the liberal Democrat who is the world's foremost expert on election fraud and founder of Black Box Voting, has attested that the Hillary Clinton camp employed massive fraud in an attempt to steal the 2016 presidential election. It is only possible, she says, to defeat such measures if the margin of victory for the non-cheating party is very large. In other words, in the real world (and not the one shown us by the Soros-affiliated pro-Clinton mainstream media), Trump actually won Tuesday's election by a popular landslide. The vast-majority of astrologers who write or talk about politics live on the political Left. Of these, virtually all have prognosticated that Clinton would win the presidency by a crushingly large margin. And of course, these astrologers were all disastrously wrong. Either their methods were deficient, and/or some form of confirmation bias caused them to fail. William Stickevers, a notable dissenter from this pack, correctly predicted both Tuesday's result and, before that, Trump's initial nomination. He uses a combination of computer-assisted statistics-based astrological models, and a team of horary astrologers, to predict election outcomes. He boasts of an 87% success rate in such matters. Clearly, the transits against the candidates' charts for election day were not enough to show a winner. We do not have a certain birth time for Clinton, and her transits for that day involving Venus and Jupiter seemed to hint at victory. On top of these, Saturn conjunct her progressed Jupiter could be interpreted as the assumption of great authority. 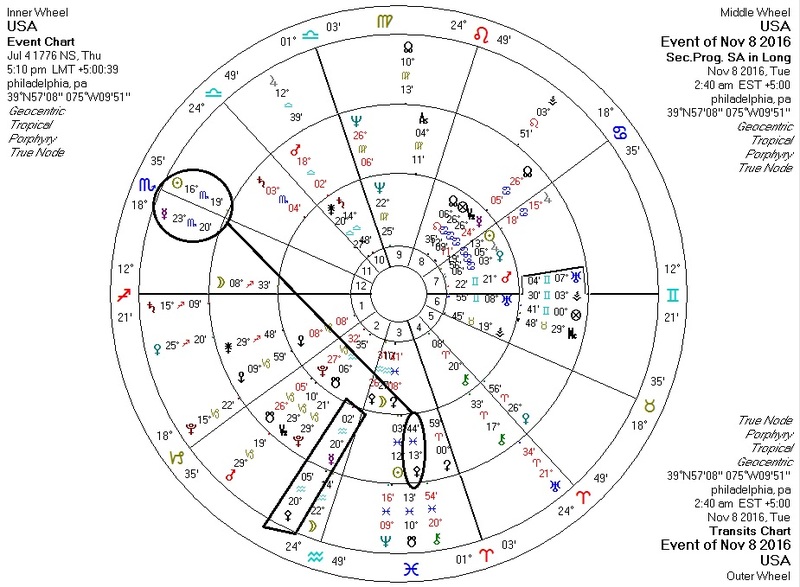 Trump's transits were, at least on the surface, less compelling: a quincunx from Venus to his natal Venus and another quincunx from the transiting Moon in the vicinity of 2:40am (ish) when Clinton called him to concede. Bob Marks' Dixville Notch chart for 2016 could be interpreted as a Trump win. The current Saturn-Pluto parallel suggests rising conservatism. US progressed Mercury suggests a significant foreign policy pivot. The waxing progressed Pallas-Sun conjunction in the US chart suggests rising libertarianism. Of these, the latter is nothing to sneeze at. China had one of these (albeit more powerful than the one we're in) in the 70's. They (partially) got rid of Communism then, and have been quasi-capitalist since. Finally, looking at transits in the sky and against the US chart at around the time Trump's victory was made official, we see massive "libertarian" indicators of the sort we tend to see when peace treaties are signed and repressive laws are abolished. These are: transiting Sun and Mercury square transiting Pallas and trine US progressed Pallas, and transiting Pallas conjunct US progressed Mercury and US Pallas. While Trump is no libertarian, he is, to the astute observer, significantly more libertarian than his mass-murdering rival. These indicators suggest (to me, at least) that despite my many misgivings with Trump, his victory was a victory on the side of ethics and justice and the general good. Taking astrology out of the equation, I have deep concerns about a Trump presidency. The astrology suggests I may be pleasantly surprised.